Different folivorous marsupials select their food from different subgenera of Eucalyptus, but the choices cannot be explained by known antifeedants, such as formylated phloroglucinol compounds or tannins, or by nutritional quality. Eucalypts contain a wide variety of plant secondary metabolites so it is difficult to use traditional methods to identify the chemicals that determine food selection. Therefore, we used a metabolomic approach in which we employed 1H nuclear magnetic resonance spectroscopy to compare chemical structures of representatives from the two subgenera and to identify chemicals that consistently differ between them. 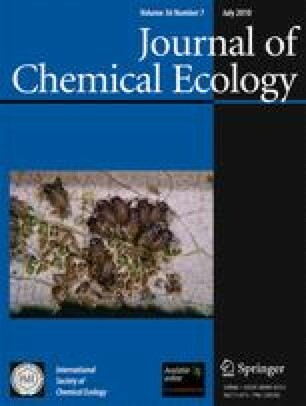 We found that dichloromethane extracts of leaves from most species in the subgenus Eucalyptus differ from those in Symphyomyrtus by the presence of free flavanones, having no substitution in Ring B. Although flavanoids are known to deter feeding by certain insects, their effects on marsupials have not been established and must be tested with controlled feeding studies. We wish to thank Cora Shiroyama for help in collecting the samples, Lynnette Lambert for assistance with 1H NMR spectroscopy and Professor Eckhard Wollenweber for valuable discussions and a generous gift of reference samples. Andras Keszei helped with the figures. The comments of three anonymous reviewers led to marked improvements in the manuscript.